The LEGO Group granted me the honor of being the first to reveal and review the new LEGO® Ideas set 21110 Research Institute. I’m extremely excited to have the final set in hand, especially because I only ever built the chemist’s lab for real. As a scientist critical and objective reviewing is part of my job so let’s get started. The front of the box shows the three vignettes and the box design with the hexagonal shapes and grey/white/turquoise color scheme certainly gives it a ‘scientific’ feel. I think the composition of the vignettes looks nice with the dinosaur in the background – probably because the final design turned out bigger than my version – although I think the background colors could have been more contrasting to the sets. The dinosaur doesn’t quite stand out to the white background and the same is the case for the blackboard and dark grey lab on the dark grey background. It does give the impression of a big room or a lab and I think that’s what they were going for. The back of the box shows the three vignettes separately in little hexagonal insets, which is nicely done. The minifigures are positioned differently compared to the front of the box and the paleontologist is shown studying the T-rex arm with the magnifying glass exactly the way I presented it in the original design. It’s great to see these details preserved. The set contains three numbered bags, one for each of the vignettes, and a small booklet in high-quality matte paper. The booklet starts with the background to the project and a scarily large photo of me in the clean laboratory of the Swedish Museum of Natural History where I work as a senior researcher. I’m setting a bad example by not wearing safety goggles (only for the photo, of course…) so hereby I apologize for that. The following pages of the booklet contain information on what paleontologists, astronomers and chemists actually do so there is a nice educational aspect to the set. The first bag contains the parts for the chemist vignette as well as an orange brick separator that will save some nail damage and teeth marks on bricks if you don’t own one yet. This set is very easy to build and very similar to the one I suggested. It’s noteworthy that the booklet pages of the chemist instructions show some hexagonal ‘molecule’-like background on the right pages, which is a great detail. Small differences between the final set and my original suggestion include a flat rather than a studded bench, the inclusion of two Erlenmeyer flasks (which I intended to be in the set, but were not yet available in LEGO Digital Designer when I designed it) and two syringe parts that represent pipettes. The addition of extra beakers is a nice touch. 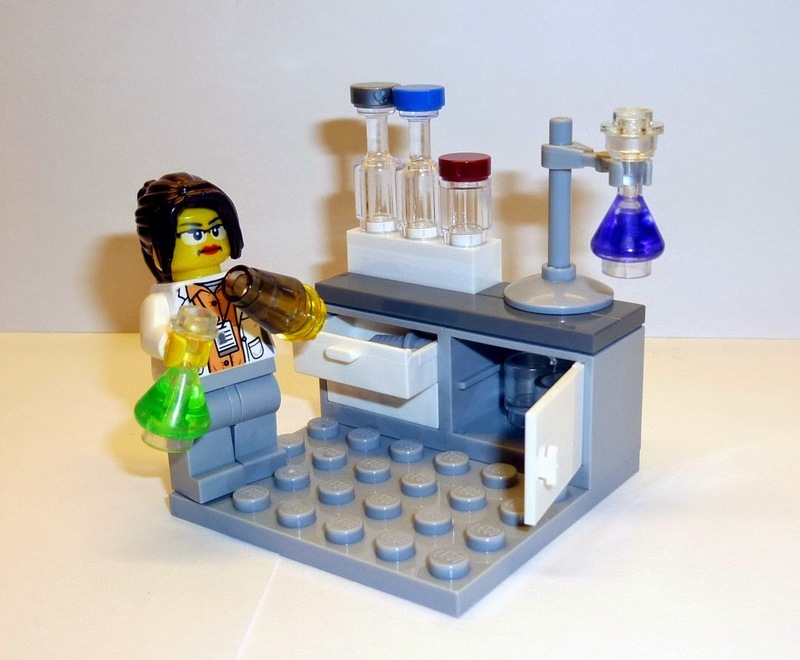 Overall, I think this representation of a little chemical laboratory is very effective and I’ve had a similar vignette proudly sitting on my office desk for years. I will discuss the minifigure later on together with the other figures. The second bag contains what will probably be the most popular vignette, the paleontologist with T-rex skeleton. Similar to the chemist instruction pages the booklet has some background decoration on the right pages, this time in the form of cute little dinosaurs. I was extremely excited to build the T-rex skeleton, because I had never actually built it before and the design was modified quite a bit. Main reasons for the changes were stability improvement and parts availability and the resulting dinosaur is a little bigger than my original design. It’s easy to see that this version is much sturdier though and I think in this case bigger is actually better. The tail part that I suggested originally was not approved for technical reasons so a different piece was used instead. A great alternative, because it really has a bone-like appearance. I’m really happy with how the final dinosaur skeleton turned out, especially since it is such a key element to the set. The final vignette of the astronomer is again a relatively simple build. The most challenging part is getting the tiles to be neatly aligned, but I am pleased that this stayed true to my original suggestion. The vignette comes with a blackboard with an awesome new print of some constellations. I was very excited to see they included Orion since that is my personal favorite. The telescope itself is identical to my design, but the stand is different. I was determined to design a tripod, because it looks great and I didn’t know of any existing designs like that. Unfortunately, the stalk piece is not quite sturdy enough to support the telescope in that way so this had to be changed to a more stable solution. I think the result looks nice and it’s certainly more robust and play-friendly. 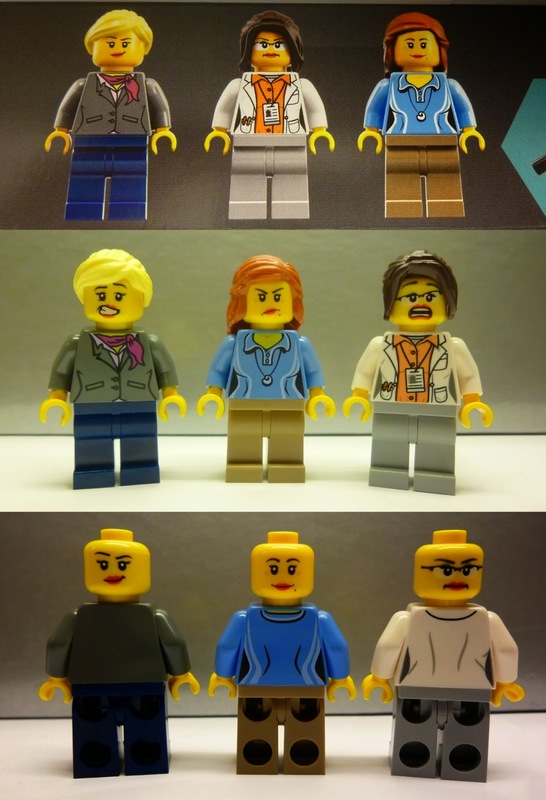 The set has three female scientist minifigures that are not identical to the ones I designed, but very similar in style. It was important for me to convey the message that most scientists wear casual clothing; only a few institutes have strict dress codes (apart from safety clothing worn in labs, of course). The chemist comes with a newly printed torso depicting a lab coat that is opened and an access/ID card around the neck. It’s great to get a new lab coat design in addition to the one they released for the collectible minifigure series. I was told the chemist figure was loosely based on me, but I would have to say I look more like my Alatariel avatar with light brown/dark blond hair and different glasses. Also, I strongly discourage wearing make-up in the lab, because it may cause contamination of the samples. I’m surprised they didn’t give her protective gloves though, like the previously released scientist figure had. In my personal version I will definitely change that, because safety comes first! The chemist and paleontologist come with printing on the back of the torso and all minifigs have prints on both sides of the head. This is an awesome aspect to the figures, because the alternative facial expressions of panic and frustration really tell stories. My collaboration with The LEGO Group has been an amazing experience and I would like to thank the whole team for the excellent work and Steen in particular for the great design improvements. Cheers to science and good play! I honestly didn't know what to expect of the final version of this set, but it seems Lego stuck fairly close to your proposal (not a bad thing, by any means). My favorite part is probably the dinosaur fossil. I've long wanted to create a science museum MOC, but fossils have always given me trouble due largely to the difficulty of making them sturdy while maintaining a skeletal appearance. Not only does this set include an awesome fossil at a reasonable scale, it includes a new piece for the tail which previously appeared in dark brown as spider legs in the Legends of Chima sets. I wouldn't have considered that part to be such a good part for fossils but it looks excellent and really gives the feel of a segmented tailbone. Since you're responsible for the inaugural review of this set, do you have any idea what price it will be sold for? Being non-licensed and modest in its scale, I hope for this to be the most affordable Ideas/Cuusoo set yet! Nice review! I look forward to the set. I wanted this set to be done so bad, I am a retired NYC Public School Teacher, and often would try to encourage my female students to aim high! I am a feminist - so there was a great need for a non Paradisa, Scala and FRIENDS set...yours fit the bill! Hey who knows, I am a New Yorker I may find this for sale in the AMERICAN MUSEUM OF NATURAL HISTORY! It goes so well with that museum! God Bless You! They look great and closely resemble your original idea and build design which must feel good. I'll certainly be buying the set, mainly as it also fits with my interests in the science/research field and because the minifigures will be a perfect fit in a larger Research MOC I am building. Great work! Can't wait to get this for myself and my kids! Great review! I won't lie, I was somewhat doubtful of this set at first. But now I want to buy it as soon as I see it! More unique prints would be nice, but what can you do? Congratulations, very happy to see this set has been made. It's been discussed in CMF series 11, I'm not sure I like the new female scientist design even though the designers did try to make her different. I liked the original design with long robe and short legs. The minifigs part is alittle debateable. I think the reason why Alatarielatelier made a "female minifigure set" was to add choices to the catalogue. If most of the parts can be obtained from normal City sets, I think it would lose the original affect. Aside from the bodies, these hairpieces are also too comnon. Those which are not commonly used (collectible minifigure ones, Friends ones) with new color variation would be better. The rest building part is very close to the original design, I'm not too surpsied and I guess I'll still get them. This is a great review! I will definately pick up a couple of these sets. One for my daughter and one for myself. They will integrate well with City themes, Agent Themes, and even a Nasa theme! Congratulations! I'm excited that your idea came to light. The final model does indeed look excellent. How exciting!! I really like it. There is a lot of imagination involved, yet it's really playable because there is a lot left to imagine!! Reminds me of the golden days of LEGO. Wow it's really beautiful and I like the Chemist vignette very much. It must be really happy for you to know your idea got used! Congrats! Look forward to its official release so that I can build it. I like this set, and love science, and will be buying this set. Congratulations on your build being selected. I LOVE THIS SO MUCH AND I RARELY IF EVER SHOUT LIKE THIS ON THE INTERNET! Okay seriously, thank you so much for your work and contribution. I am so excited to buy this set. I love that the chemist looks slightly angry. Very accurate in my experience as a slightly angry female chemist. Quite excited about this set, and congratulations on getting so much support on your idea! I'm so happy you've succeeded, because it will mean a lot to the generations of girls--and boys, too--who grow up with LEGO as so many of us have, and even still enjoy. Especially the paleontologist model--I wanted to be a paleontologist when I was growing up :) And Orion is my favourite constellation, too. Now I'm studying as an engineering student, anyway... but at any rate, this LEGO set is such a great release. Dr. Kooijman. I am very excited for this set to go to production. I would like to talk with you about speaking on a panel at a conference I'm hosting. The session will be on the importance of women in science and technology. This set is brilliant and brings attention to a critical issue in our society. The event is the 2014 Michigan Broadband Conference and more info is here: http://www.connectmi.org/broadband-summit. Can you please contact me at info@connectmi.org? I look forward to hearing from you! No women of color represented? I thought this product was aimed toward ALL young girls, but I guess not. Great idea, however, it's a shame to know the needs of whites only are still a priority. Bought this for my college freshman daughter - who is studying biochemistry - for her birthday. We had lots of legos for the kids growing up - but none that were "hers" because her older brothers had so many. Very happy to have snagged this set - and hope there will be more to follow. I started a website Bricks-Maniacs.com and I would like to invite You to take a look and maybe share some of Your Lego pictures or videos. Purpose of the website is to collect Lego related pictures (everyone can add theirs) and share fun, inspiration and cool ideas. Okay, I have a burning question to ask you. What on earth is the grey and yellow thing the chemist is holding in all of the pictures? I am a chemist, and for the life of me can't sort out what it is supposed to be. LOVE the set, just can't figure out that one accessory. collective term; it has number of other courses as well like, Journalism, Anchoring, Radio Jockey, writing and many more. you achieve an immense amount of popularity and business across the globe.